Morning everyone, happy Sunday to you. I love the start of a new month as it's kit launch time. WHOP WHOP. 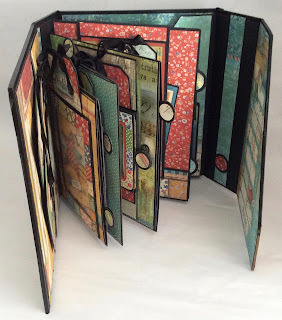 For the October Kit I designed a new style of album cover with hidden magnetic closure, and used the bright and colourful 12 x 12 papers from the Patchwork collection by Stamperia to decorate the album cover and pages. There's lots of trendy images running through the collection that were just perfect to turn into photo frames and neat little journaling tags. Lots to flip up, fold out and slide about on the pages, and then at the back there's a neat file folder to hold lots of other bits and pieces you may want to keep in the album too. Here's a few more pics and the full project video too. As always, everything you need to create the project is included in the kit. Just use your own paper trimmer and tools, follow the instructions and short videos to turn your box of goodies into a gorgeous keepsake. I love love love this. Brilliant design and papers again. Hi Clare, Wow !! I love these papers and your album is, as always, stunning !! I especially love your tabs on the pullouts, and also the way how you can slide tags into the various frames, it is really gorgeous. Love this stamperia pad....and your album too, as always gorgeous! Beautiful kit and papers Clare ,you always amaze me with your work and designs .The Album is just full of wonder and gorgeousness.